Preheat your barbecue for indirect cooking. For further instructions as to how to do this, please refer to your supplied handbook. Wash the beetroot and wrap in aluminium foil. Once your barbecue is preheated, turn to the roast setting on your barbecue. Place the wrapped beetroot in the barbecue and roast for 40-50 minutes or until tender. Once cooked remove from the barbecue and set aside to cool. Once the beetroot is cooled remove the skin and slice into wedges. In a screw top jar place all the dressing ingredients, and shake until the ingredients are well combined. Place the rocket in a large serving bowl. 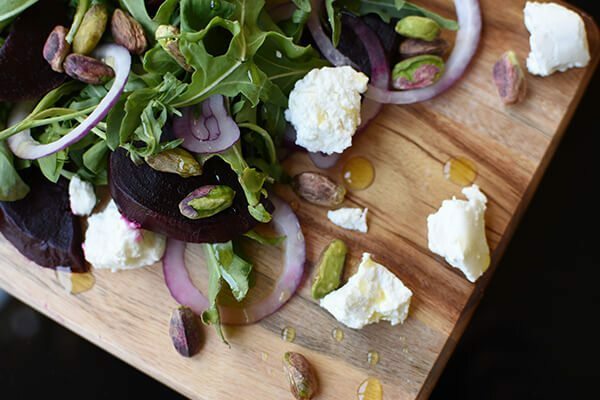 Top the rocket with the sliced beetroot, red onion, goat’s cheese and pistachios.